I ran my cardstock through the paper crimper to break down the fibers so I could separate the layers. The next step was tearing the now thin and soft paper into gradient circles to make my flowers. I added some little pearls to the center and attached it to a paper crimped tag. They are all so pretty, I remember doing those flowers some time ago but I never put them through the crimper, I love that look! Your cards are so pretty! I love the torn paper rose! Such a fresh idea. 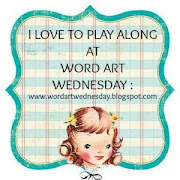 Thank you so much for entering your truly creative and beautiful art in our challenge this fortnight at Word Art Wednesday.